Well, here we are again for another letter. It is nice to hear everyone doing well. There is not a lot that has happened this past week. We went to Miyazaki Tuesday for a district meeting. We ate at Sushiro for lunch before we took the trains back. It was this place where you order your food and it comes on a conveyer belt. I tried this piece of sushi with shrimp on it, it was super gross. So all I ordered was ones with cooked meat on it. We had a undokai, which is hard to explain in English. It is an activity where you do a bunch of sport activities, like running races, and other games. The key word was outside. For one it was super cloudy out and I did not think I needed sunscreen. But I guess I did because I got sunburned pretty bad. After and during the eikaiwa the members were helping me and bought me lotion. The members here are super nice. We then went to this tomato ramen place, which I know you would love. If I could take you to one place it would be there. It was so dang good. Think of the tomato soup from Zupas but better with noodles and veggies in it. Sooo good. On the day I got the sunburn we went to do a home teaching lesson which was far away. I almost felt like passing out. Then that night I felt really sick. The next day we stayed in all day for me to recover. The day I went out to work but during my companion zoomed ahead of me and I lost him. I stopped and waited for like five minutes before he came back. I was freaking out a bit. Last week the mission president said he will transfer me to a big city so I won’t have to ride a bike such long distances. I’ve had great experiences here and in the MTC but the MTC doesn’t really prepare you for real missionary work. I think I deluded myself into thinking that this not going to be super hard and I could go and improve at a small pace. Yeahh….not like that at all. But my mission president is really helping me out and I feel always better after I talk to him. I’m looking forward to the Mother’s day call next week when I can tell you more face-to-face. 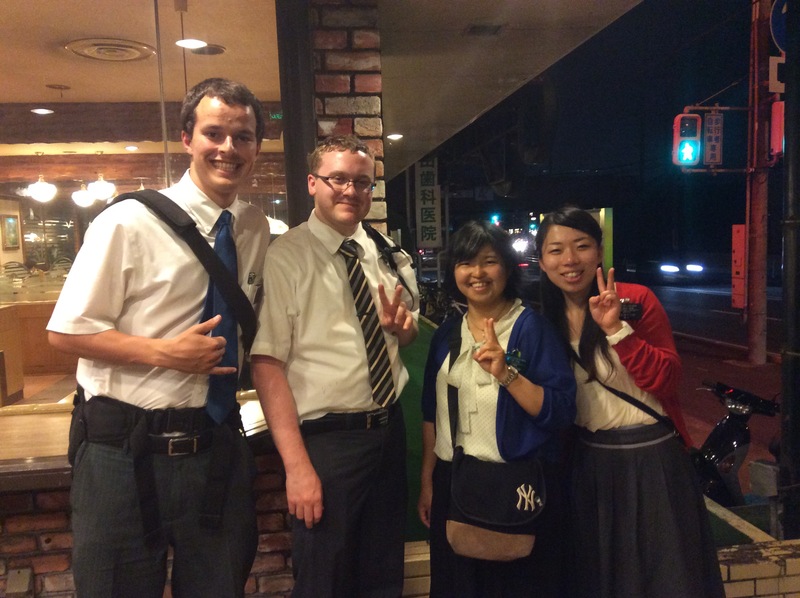 Here’s a picture of my companion and the sister missionaries in Miyakonojo.